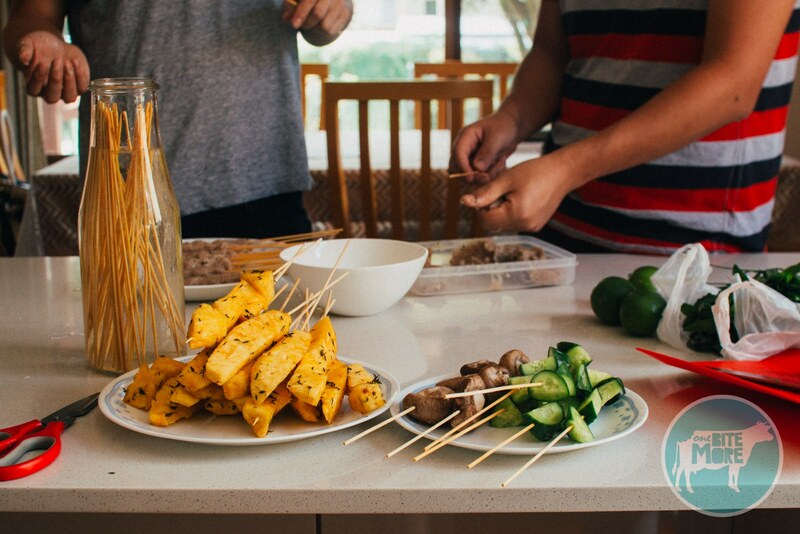 How to throw a skewer party! When I planned and photographed a fried chicken party back in January, I thought it would be the last opportunity for me to put together a bit of a celebration story before cold, dark days and chilly nights took over. 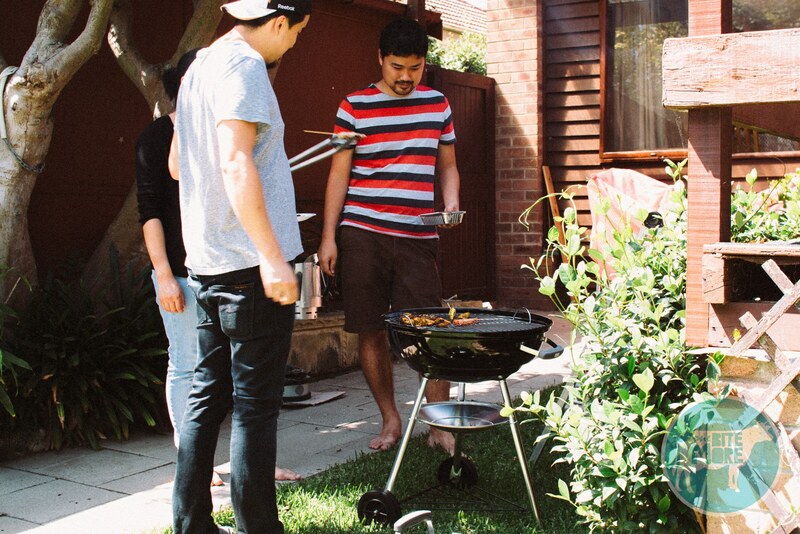 The day of my skewer party (a petite party of four, but a party no less) was a scorcher here in Sydney, with temperatures hitting the high thirties and the very real threat of sunburn always in the back of our minds – not to mention the backs of our necks. You can put less food out when it’s on sticks and people won’t even notice how cheap you’re being because LOOK! Skewers! So. Cute. …and the timing was perfect. Early Autumn, when Australia hasn’t quite gotten the “time to cool it!” memo and the skies are as blue as they were in mid-December. On one of my mid-week weekends, no less, with the husband on a contract break and two of my best buddies still on flexible time thanks to the wonder that is paperwork-holding-up-a-food-truck-opening. Being the photogenic (and very accommodating) people they are, I thought I’d stray a little bit from my usual word-smithing and let my photos of our grand-day-off adventuring tell the story. For the most part, anyway. “We should get the coals going before we start skewering, right?” Lex had asked earlier, suspicious of my ability to have them fed before sunset. “No way. It’ll be half an hour to an hour for sure.” he replied, with the authority of someone who’d spent a good hour trying to light some white coal for his Japanese barbecue recently. “Yeah, for sure.” said I, with the authority of a sassy 7 year old who believed unwaveringly in the power of properly read instructions. “Ok, your call.” he relented, pulling a face. Credit where it’s due, I was a little nervous myself. Years of eating at half past nine, accompanied by an empty box of firelighters and another of broken matches, will do that to a person. Especially a coal grilling novice like myself. But I persisted with the plan, and, when it came time to get cooking, made Koji start the timer to see who was right (and who was, hopefully not, hungry). 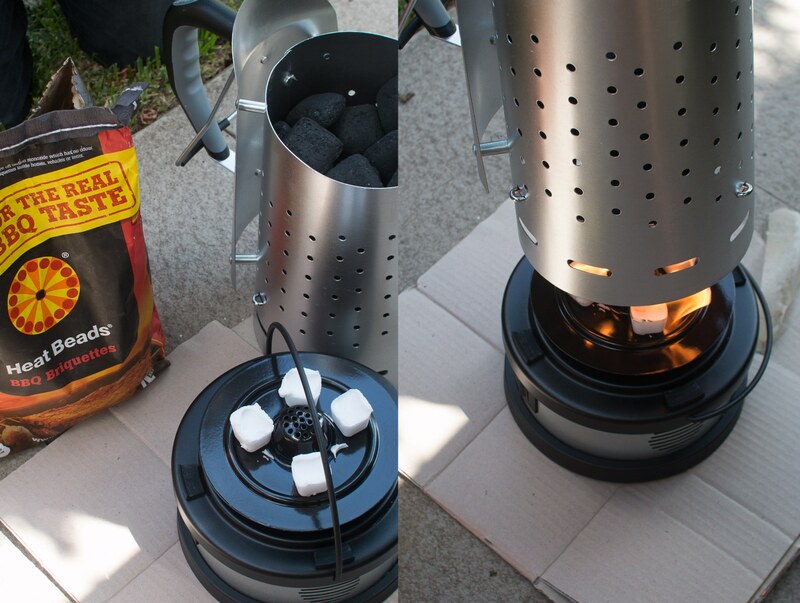 We could probably have stopped it at 12 minutes, but thought we’d keep it going until the coals up top were properly ashed over. 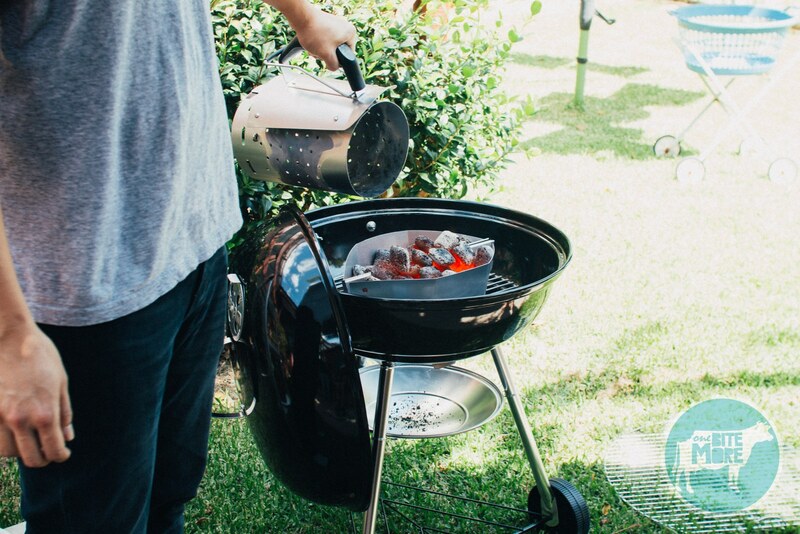 Glowing beads were tipped into a tray, the grill was popped on top, and we were smoking hot and ready to go. 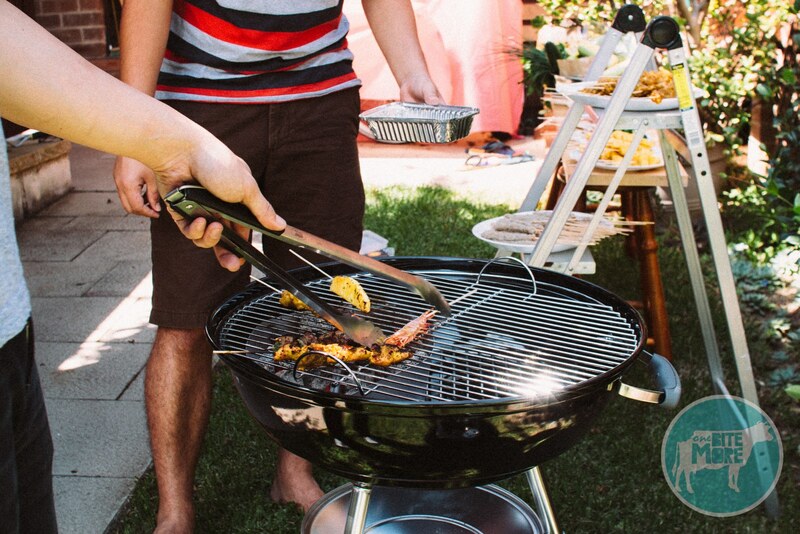 With the coals glowing, we were ready to get grilling. 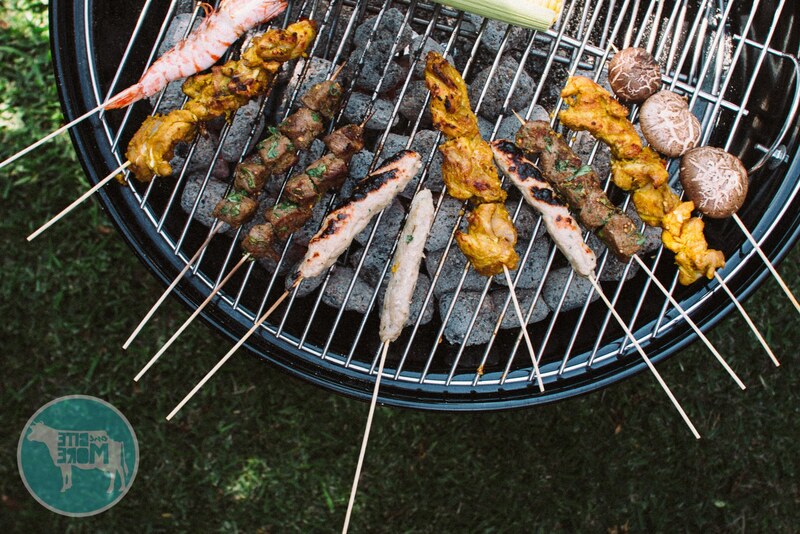 I’ve included all of the recipes for our little party below – fish and pork nem nuong, malaysian chicken satay, spicy coriander lamb skewers, grilled cayenne & thyme pineapple sticks and so much more. A ladder held the larger platters, while the smaller plates and bowls got spread out along an old shelf, propped up on a matching pair of stools. 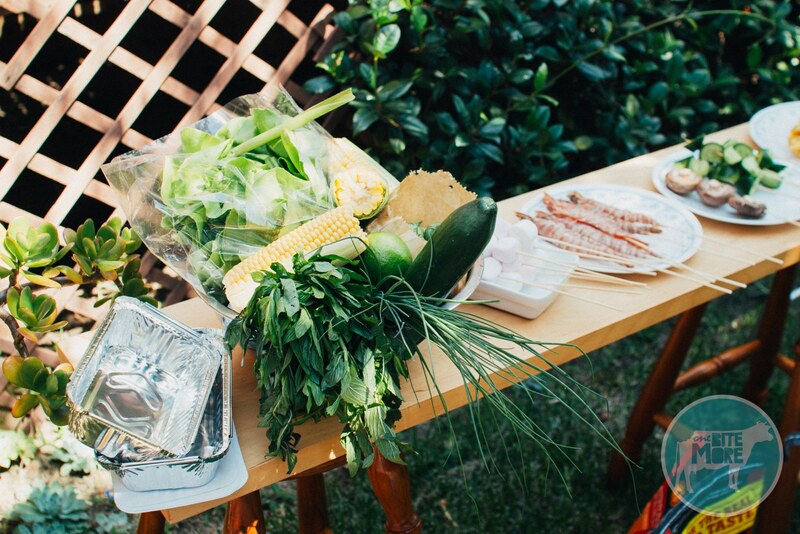 A packet of foil trays were provided for guests to put the raw skewers in while they walked to the barbecue, and plates were given out for the cooked meats, along with bunches of fresh herbs and lettuce for wrapping the cooked meat in. 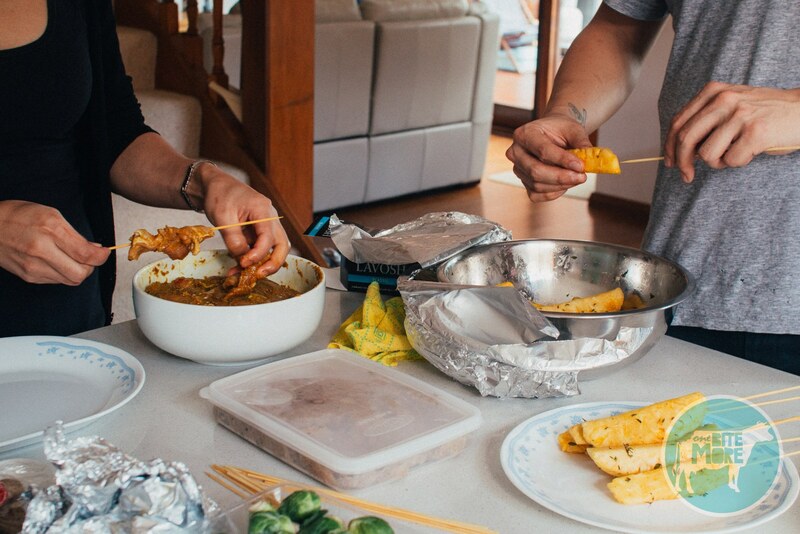 There was more than enough for the four of us – my family were eating leftovers for days afterwards – and it only took our eight, slightly distracted, hands a grand total of 10 minutes to get all of the food onto sticks. Not too much time at all considering we had so much to catch up on as we prodded, poked and moulded our food. We spent the rest of the afternoon basking in the heady scent of charred meat (some of them were forgotten for just a moment too long!) and a cold cider or two, the afternoon sun beating down on our necks and smears of sticky, sweet pineapple on our fingers. And when, at last, we were done, we toasted some marshmallows over the dying embers, laughing as the sticky strands clung to our teeth, glad that Summer wasn’t really over. Not yet. Maybe not ever. There's enough food in here to feed a happy crowd - the four of us barely made a dent! And the skewering itself goes pretty quickly when you've got lots of hands on board. 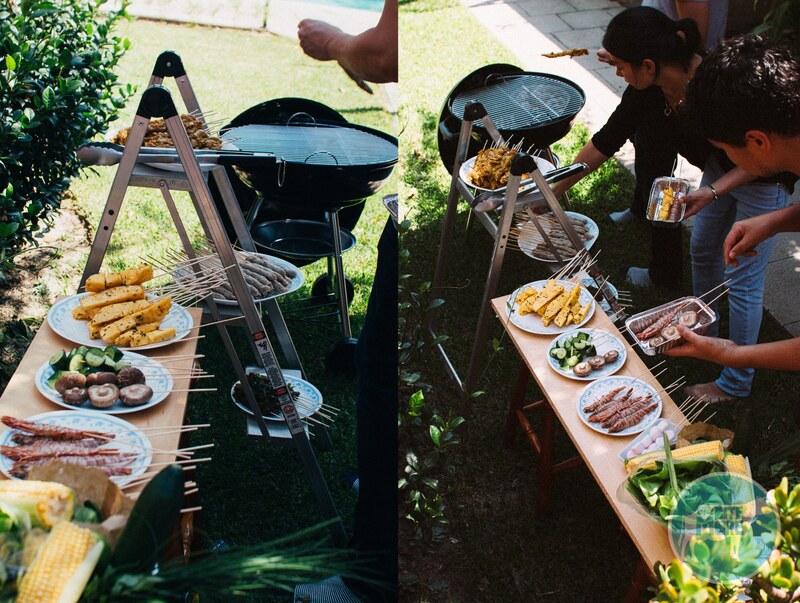 Between four of us, we managed to get everything skewered and ready to go in less than 10 minutes :) Mix and match your recipes and give everyone a go at grilling their own, so no-one gets stuck with the tongs all afternoon. Soak two packets (at least 80) bamboo skewers in cold water for half an hour before using them. 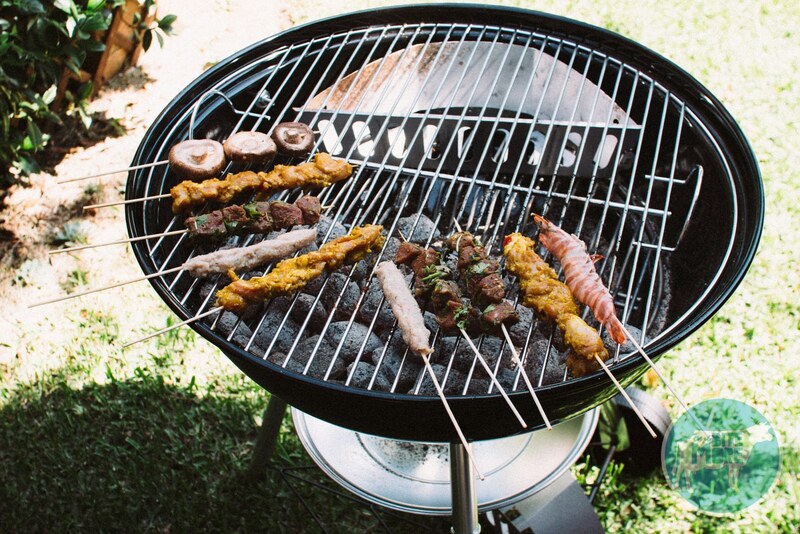 Thread the chicken, lamb and pork onto the skewers in accordance with the recipes below. 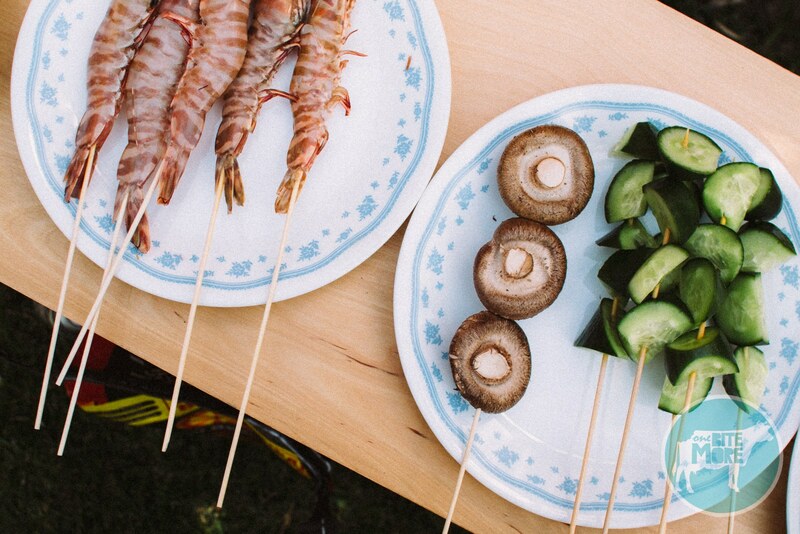 Straighten each prawn out and push the skewer through the tail, along the body and into the head until each prawn has a skewer in it. Thread five marshmallows onto each skewer in an alternating pink and white pattern. Cut the pineapple into 2-3cm wedges and put them in a non-reactive bowl. Sprinkle the cayenne pepper over the top and strip the thyme leaves off the stems and into the bowl. Sprinkle the brown sugar over the top of that and massage everything in. 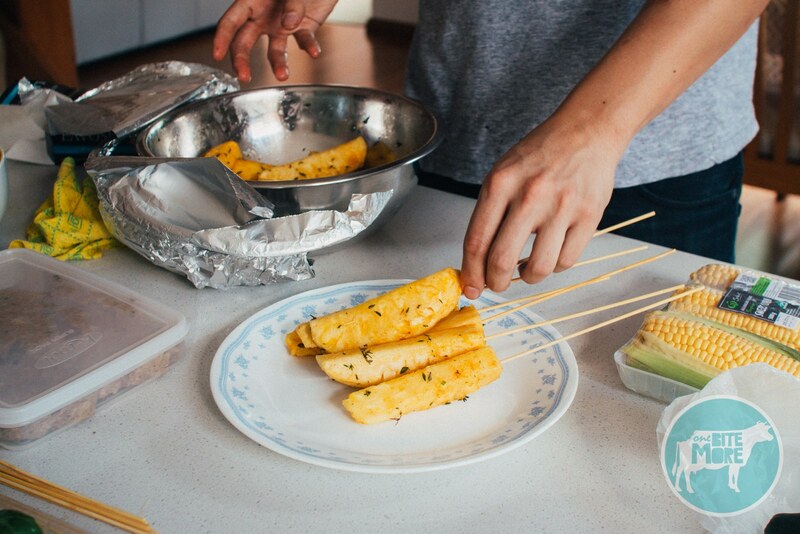 Put two skewers into each pineapple wedge so that it makes it easier to flip them later. Chop the cucumber into thick chunks and skewer five or six pieces onto each skewer. 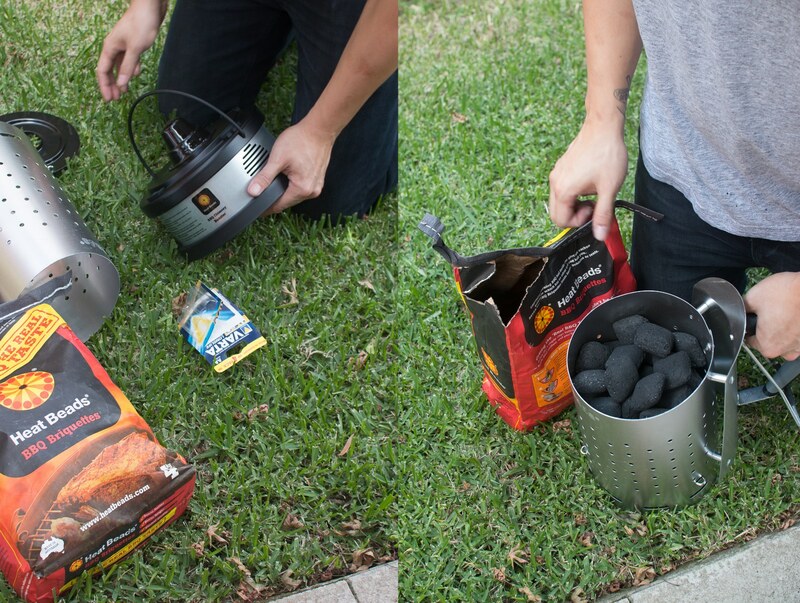 Now you've prepared everything and you're ready to grill! 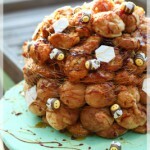 I love lamb in all of its forms - but this one will really set your mouth on fire! 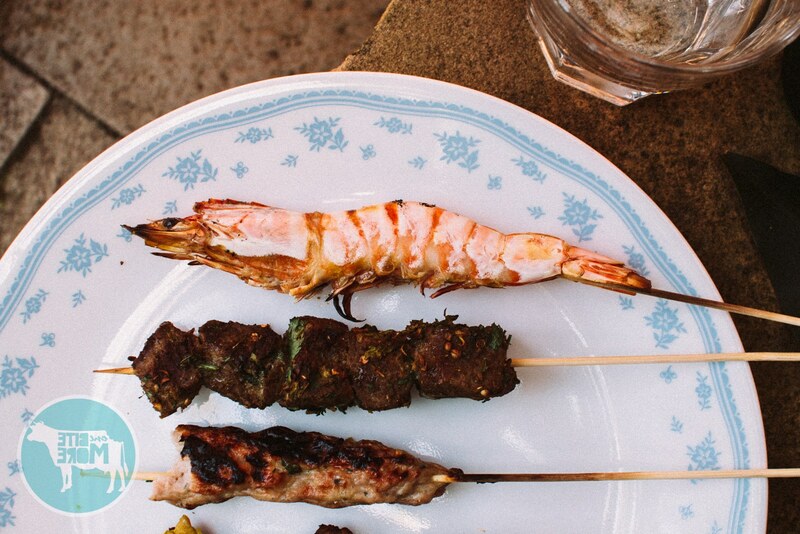 You can cook the skewers as you prefer your lamb. I like mine on the rarer side, but they'll still be absolutely delicious cooked well done. Put the cumin seed and coriander seed into a small dry pan and toast it over a medium heat, tossing it from time to time, until you can smell the oils being released. Then remove the pan and the spices from heat. Put the toasted spices, dried birds eye chillis and szechuan peppercorns into a spice grinder or mortar and pestle and grind them up until they are coarsely ground. Wash the coriander well and chop it finely - leaves, stalks and roots. Mix the ground spices, coriander, rice wine, salt and oil in a non reactive bowl. Cut the lamb backstrap into 2cm cubes and then pop them into the marinade, massaging them together well. Let this sit for at least 2 hours before threading four to five pieces per skewer and grilling! You'll need to start the marinating process the night before so that the fragrant spices get a chance to soak into the chicken. 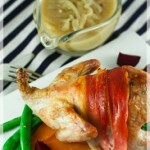 I used a combination of chicken breast fillets, thigh fillets and drumstick fillets for this recipe. Put the cumin seeds into a dry pan and toast them on a medium heat until you can start to smell the oils being released. Pop the toasted cumin into a spice grinder or mortar and pestle and grind them coarsely. Grate the ginger into a food processor and add the crushed cumin seed. Chop the lemongrass roots finely, discarding the fibrous, woody tops and the very bottom of the root. 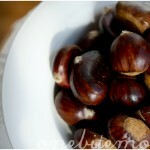 Pop these into the bowl of the food processor too. 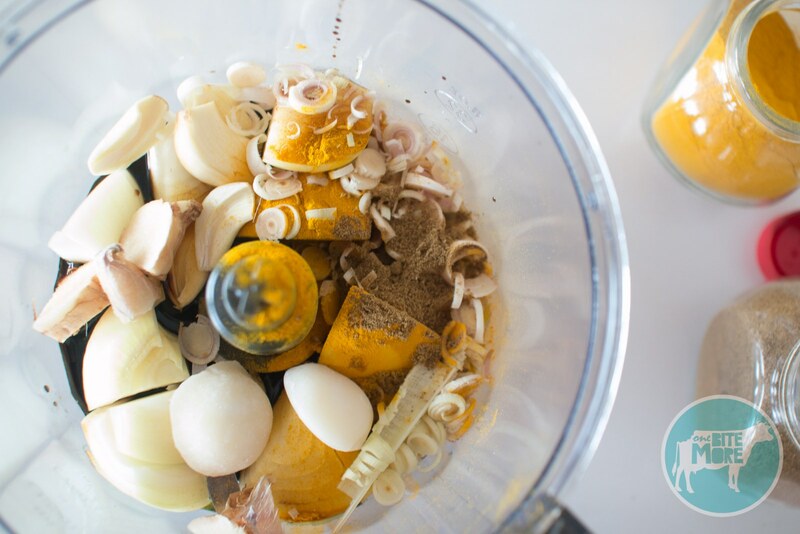 Cut the onion into chunks and put it into the food processor bowl along with the peeled garlic, soy sauce, peanut oil, turmeric, salt and pepper. Whizz it all together until its a bright yellow paste. Cut the chicken on the diagonal, across the fibres, so that the chicken will be super tender when it's cooked. You want 3cm thick slices. 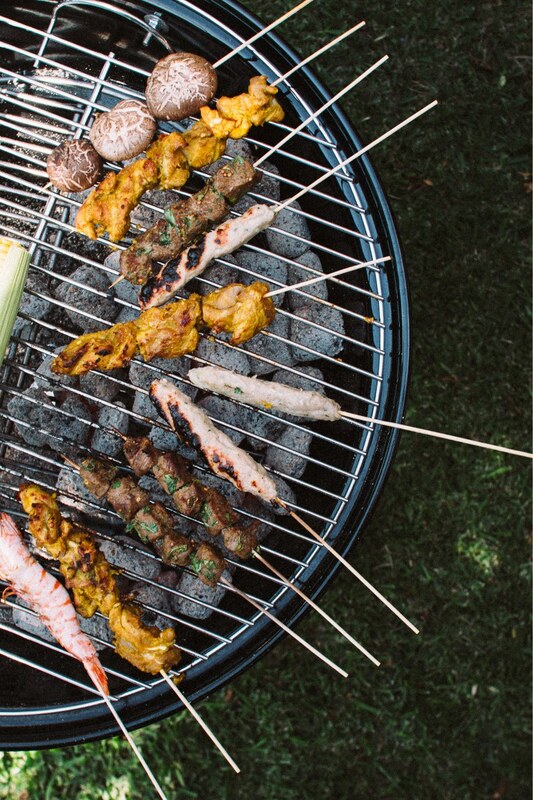 Massage the marinade into the chicken and leave it overnight (or for at least 4 hours) before skewering three pieces onto each stick, lengthwise and grilling! The fish paste that I use comes frozen in plastic bags from the chiller section at my Asian grocery store. You'll need to defrost it before using it. Snip the garilc chives finely into a bowl. 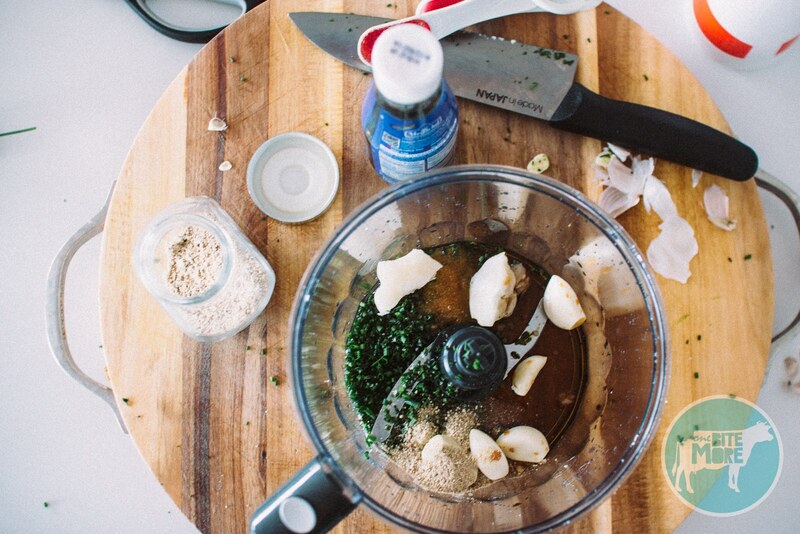 Peel the garlic and chop it as finely as possible, or put it in a food processor and whizz it until it is a paste. 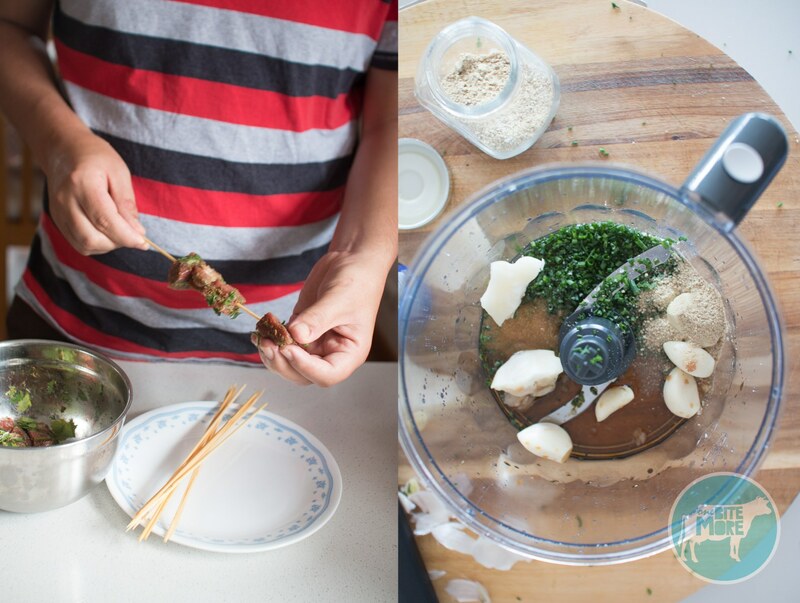 Put the minced pork, fish paste, fish sauce, palm sugar, salt and white pepper into the bowl of a food processor and whizz it back together until it starts to look sticky. If you don't have a food processor, pound it all together with your hands, massaging it until the mixture is springy. You'll be able to feel the change in texture as the meat starts to get stretchy. 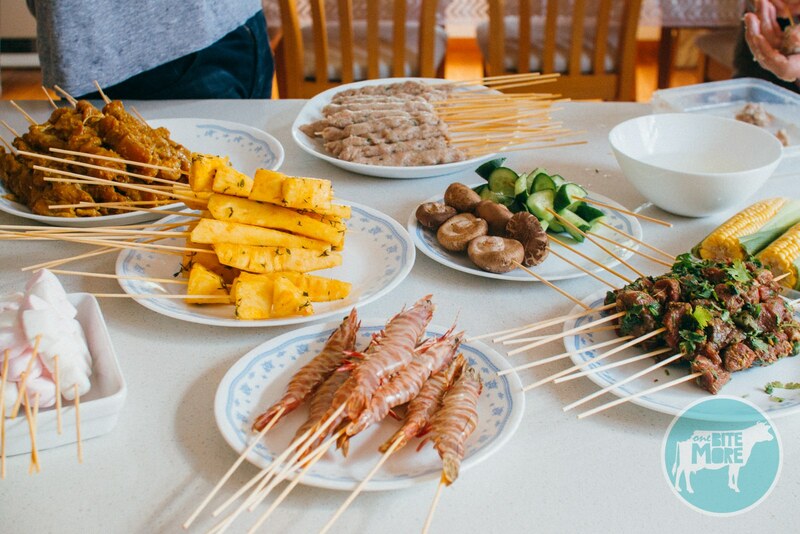 To thread the paste onto skewers, wet your hands, take a small handful of the mixture and form it into a sausage shape around the skewer, spreading it down half the stick. Repeat with the remaining mixture until you've run out of it. 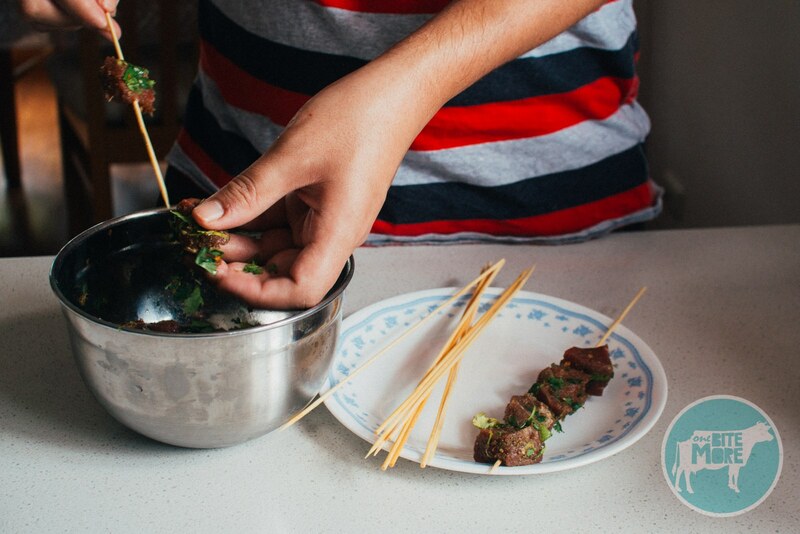 Lay finished skewers onto an oiled tray in a single layer so they don't stick together. 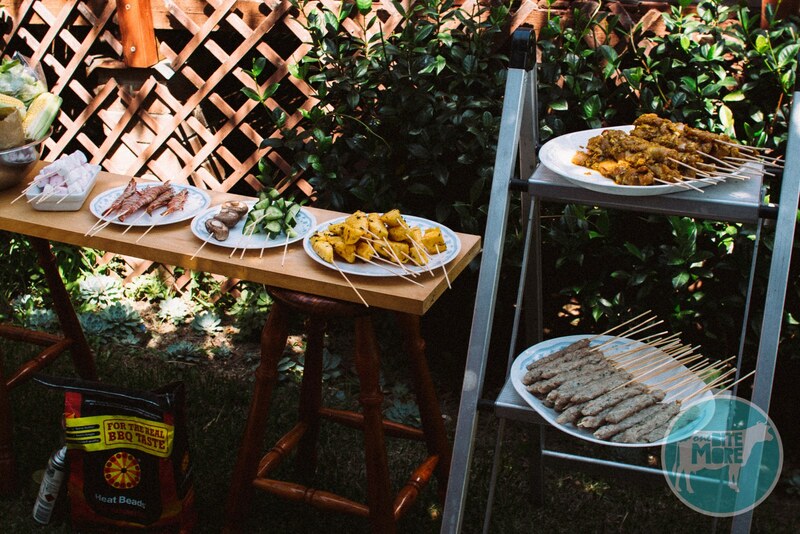 When you've finished forming all of the skewers, you're ready to grill! The nem nuong will be cooked when it takes on a slightly spongey texture with a skin on the outside. 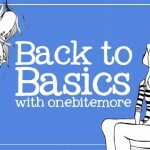 *This is an editorial post, commissioned by Heat Beads®. 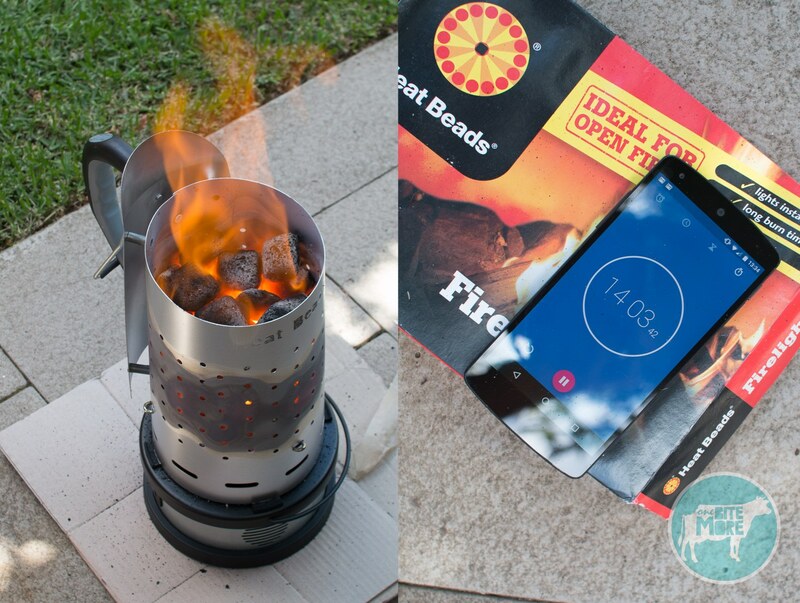 The Heat Beads ® Chimney is available for $59.95, the Booster is available for $29.95, or you can buy both in a package for $84.95. See the Heat Beads® site for further details.